If you're looking for high quality and personal service, you've come to the right place. 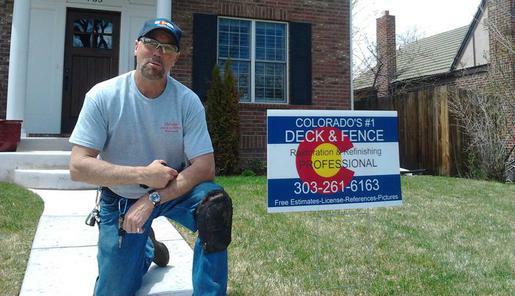 At COLORADO DECK AND FENCE RESTORATION PRO we'll give you the attention and personal service you’ll come to expect and enjoy. 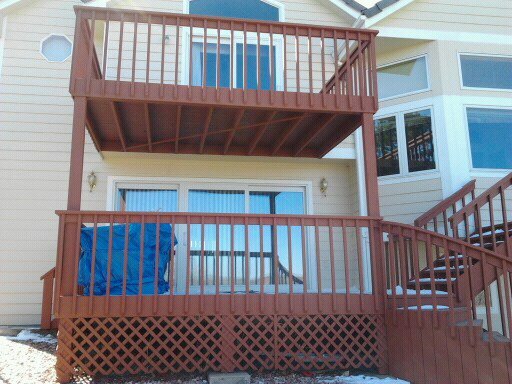 (Replace with your customer's testimonial or review) "I really like the services that COLORADO DECK AND FENCE RESTORATION PRO'S has to offer. I'm definitely going back!" and Ledger Boards or Under Deck Supports. We fix and replace the damaged and rotted wood. THIS IS A COMPOSITE DECK WE STAINED WITH A COMPOSITE STAIN AND MADE THIS OLD TREX DECK LOOK NEW AGAIN.THIS DECK IS 17 YEARS OLD "REFINISHED 2017"
THIS DECK WAS NOT RESTORABLE ACORDING TO OTHER SO CALLED PROFESSIONALS.MY TWO MAN CREW AND I DID A "TWO COAT" DECK OVER MATREIAL MADE BY BEHR DECK STAIN AND FIXED THIS DECK TO LAST ANOTHER 5 YEARS THIS DECK IS 30 YEAR OLD REDWOOD "RESTORED 2017"
IF I HAVE'NT WORKED ON YOUR DECK ASK YOUR NEIGHBOR IF IV DONE WORK THERE'S I PROBABLY HAVE . I LOOK FORWARD TO MEETING YOU AND WINNING YOUR CONFIDANCE.